The Badgers are headed to the title game, and once again the story is Offense vs. Defense. Duke's defense has nothing—nothing—on Kentucky's. But today Jahlil Okafor is preparing for what's likely his final college game while Willie Cauley-Stein obviously has some other important business to attend to. 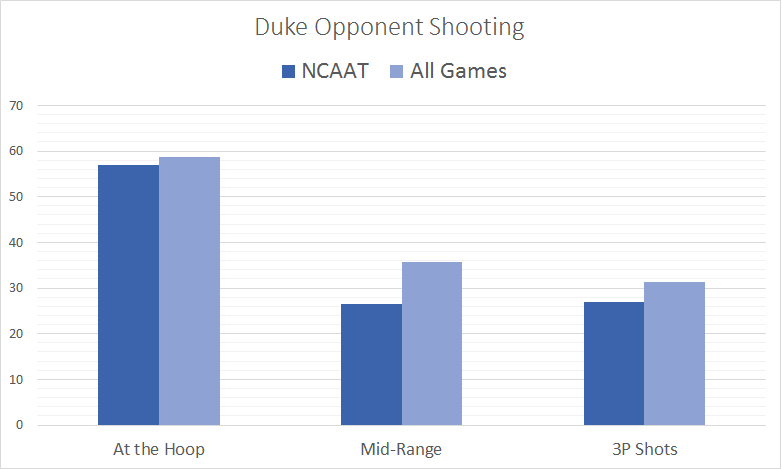 And the reason Duke's been so successful in the Tournament has been the unexpected play of the defense, which was not a strength in the regular season. Of course billing this game as "Offense vs. Defense" seems silly considering we're talking about two top-3 offenses. Duke's offense goes through Okafor, the most devastating two-point weapon in the country. I suspect the Devils will go to him early and often, and Frank Kaminsky will need to be at his best to avoid fouls. Okafor's sidekick in the offense is Justice Winslow, who looks more like a Wisconsin big man in that he's just as comfortable shooting 3s (making 42 percent of them on the season) as he is scoring in the paint. He's also a plus ballhandler, so he's not easy to pressure into mistakes. But I'm optimistic that Wisconsin will be able to slow this Duke offense just enough. A team that shares a lot of the same defensive principles (although that team was much better on that side of the ball this year) is Utah. Both teams are very good at forcing opponents to settle for mid-range jumpshots, although the Utes tend to challenge shots more aggressively (with the expected quid pro quo showing up in the rebounding). It might be no coincidence that Utah was the only team that held Duke to under a point per possession in the Tournament. I expect Wisconsin to pretty much give Okafor whatever he wants outside of 8-10 feet, with some weak side help defense if he establishes position in the post. For those who are not familiar with the Blue Devil defense, the short version is that the Devils have an extreme (though less so, in recent seasons) overplay defense that gets into passing lanes and extends very far into the perimeter. This approach tends to minimize 3-point shots, and create turnovers (though less so on the latter, in recent seasons). Of course, that leaves the perimeter defender susceptible to a blow-by. So what's changed in the postseason? Well, opponents are simply missing their jumpshots. It's likely that Wisconsin will attempt a fair number of jumpshots. If they make them, they will win (#analysis). But will those shots be open jumpers that are largely behind the three-point line? For that to happen, Wisconsin needs to rotate the ball. So far, Duke's defense sounds a lot like the basic framework of the Purdue defense. Both are overplay systems that extend the defense well outside the three-point line. But instead of relying on a JaJuan Johnson or A.J. Hammons swat shots, Duke's system employs rotations that step in to take charges. This possession (at 3:03, action starting at 3:10) highlights a good defensive outcome using Duke's core principles. With the defense extended so far, the offense cannot get a good outside shot, so the ballhandler easily drives past the perimeter defense. But the rotation is there, in part because instead of sticking with his man in the opposite corner, Tyler Thornton spends most of the possession with both feet in the paint, so he's in position to help. Thus, the challenge for Wisconsin's offense will be whether it can rotate the ball faster than Duke's defense can help and recover. But the Badgers have an advantage here that most teams do not—almost always, all 5 players on the floor have the green light to shoot a 3-pointer. That means Duke's help side defense will be put in a tough situation, as sticking with the defensive plan means leaving a 3-point shooter wide open. Simply put, the best way to beat Duke's defense is to pass the basketball. Heroball is a surefire way to end up with turnovers and empty possessions. But that's why I like this matchup for Wisconsin, this is a team that passes. It's not a surprise, as one of Bo Ryan's sayings is "if you can't pass and catch, you can't play." But win or lose, this will be your last chance to see the best offense of the past fourteen (or more) seasons. And it's being executed by a bunch of clowns. If this is what a broken sport looks like, please don't fix it.